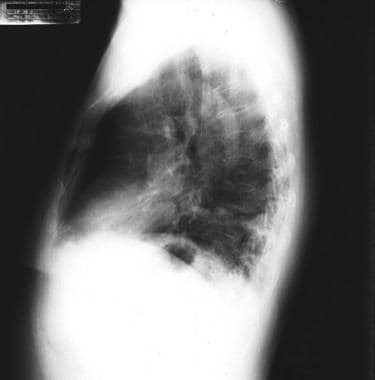 Pulmonary arteriovenous malformations (PAVMs) were first described in 1897. They consist of abnormal communications between the pulmonary arteries and the pulmonary veins. These are also referred to as pulmonary arteriovenous fistulae. Most patients with pulmonary arteriovenous malformations have the autosomal dominant disease hereditary hemorrhagic telangiectasia (HHT). However, at least 15% of patients with pulmonary arteriovenous malformations do not meet criteria for the diagnosis of HHT and have no other systemic disease. Pulmonary arteriovenous malformations may also be an acquired condition found in patients with liver disease, mainly liver cirrhosis. In these patients, absence of a hepatic "factor" may lead to the development of pulmonary arteriovenous malformations. Patients with congenital heart disease in whom the systemic venous return to the lungs does not include blood return from the hepatic veins also develop pulmonary arteriovenous malformations. Pulmonary arteriovenous malformations may also be acquired rarely secondary to chronic infections such as schistosomiasis, actinomycosis, tuberculosis, and metastatic thyroid cancer. These arteriovenous malformations may form a communication between pulmonary artery and pulmonary vein or between a bronchial artery and the pulmonary vein. Mucosal telangiectasias are shown in a patient with hereditary hemorrhagic telangiectasia (HHT). Approximately 70% of pulmonary arteriovenous malformation cases are associated with HHT. Conversely, approximately 15-35% of persons with HHT have pulmonary arteriovenous malformations. Approximately 53-70% of pulmonary arteriovenous malformations are found in the lower lobes. See the images below. Left lower lobe arteriovenous malformation (AVM). Lateral radiograph showing a left lower lobe arteriovenous malformation (AVM). Approximately 70% of patients have unilateral disease, 36% have multiple lesions, and 50% of those with multiple lesions have bilateral disease. Pulmonary arteriovenous malformations may be microscopic (ie, telangiectasis), but they are typically 1-5 cm. Occasionally, pulmonary arteriovenous malformations as large as 10 cm are encountered. Approximately 10% of patients may have diffuse microvascular pulmonary arteriovenous malformations in combination with larger, radiographically visible pulmonary arteriovenous malformations. The vascular channels are thin walled and lined with a layer of endothelium. The connective tissue stroma is scant and has no communication with the surrounding lung. Most pulmonary arteriovenous malformations drain into the left atrium, but anomalous drainage to the inferior vena cava or innominate veins has been reported. The malformations may appear as one of the following: a large single sac, a plexiform mass of dilated vascular channels, or a dilated tortuous direct communication between artery and vein. Pulmonary arteriovenous malformations can be classified as simple or complex types on the basis of their architecture. Simple pulmonary arteriovenous malformations have a single feeding segmental artery leading to single draining pulmonary vein. Approximately 79% of pulmonary arteriovenous malformations are of the simple type;  most of the associated aneurysms are nonseptate and occur in the lower lobes. Approximately 21% of pulmonary arteriovenous malformations are complex, having 2 or more feeding arteries or draining veins. They often occur in the lingula and right middle lobe distributions. See the image below. Large left lower lobe arteriovenous malformation (AVM) showing a feeding vessel to the left atrium. In a pulmonary arteriovenous malformation, blood bypasses the normal oxygen-exchanging pulmonary capillary bed, returning desaturated to the pulmonary veins. When the return of desaturated blood to the pulmonary veins becomes significant, measurable arterial oxygen desaturation and cyanosis results. Because most pulmonary arteriovenous malformations are found in the lower lobes and, in the upright position, more blood is directed to the lower lobes because of gravity, the patient with significant pulmonary arteriovenous malformations demonstrates orthodeoxia, which is a fall in arterial oxygen saturation when in the upright position. 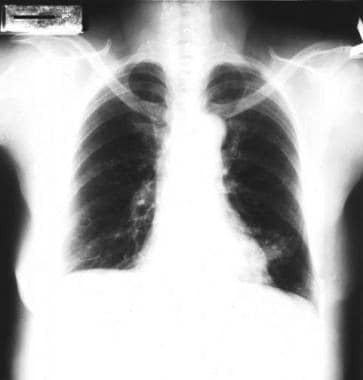 If the patient becomes significantly desaturated in the upright position, the patient also demonstrates platypnea, which is dyspnea in the upright position, although this symptom is seen only in advanced cases. The resultant cyanosis leads to a compensatory rise in hematocrit and hemoglobin concentration roughly proportional to the degree of chronic desaturation. However, bleeding from epistaxis and from GI telangiectasias may reduce the hemoglobin concentrations in patients with HHT and lead to iron deficiency anemia. Larger arteriovenous malformations allow particles of significant size to pass unfiltered from the systemic venous system to the left atrium and systemic arterial circulation. Stroke from paradoxical embolization is a risk in patients with macroscopic arteriovenous malformations. Unlike systemic arteriovenous malformations, pulmonary arteriovenous malformations do not lead to high-output cardiac failure even when large. This is because the rate-limiting portion of the circulation is the systemic arterial resistance. Systemic arteriovenous malformations lower the overall total systemic venous resistance and increase venous return, which is a synonym for cardiac output. The pulmonary vascular resistance is normally low and is not rate-limiting. Lowering the total pulmonary vascular resistance further does not increase the cardiac output. See the Cardiac Output and the Pulmonary Vascular Resistance calculators. A few caveats with this explanation are necessary. First, by causing cyanosis, pulmonary arteriovenous malformations cause the cardiac index to somewhat increase in order to maintain adequate oxygen delivery. Second, liver cirrhosis by itself causes systemic vasodilation and a hyperdynamic circulation, even in the absence of pulmonary arteriovenous malformations. Third, patients with HHT may have other systemic arteriovenous malformations, especially cerebral and hepatic, which may lead to reduced systemic vascular resistance and a high cardiac output state. In HHT, mutations of 2 genes make up most cases. Endoglin gene mutations lead to the clinical subtype of HHT-1, and mutations in the activin A receptor type II-like 1 gene (ACVRL1) lead to the clinical subtype HHT-2. Most mutations described are family-specific without a "common mutation" pattern that is often seen in other inherited conditions. Endoglin and ACVRL-1 bind tumor growth factor-beta (TGFβ), which is implicated in angiogenesis. Pulmonary arteriovenous malformations likely develop as a result of interplay of various factors among diverse cells and matrix during vascular insults. Changes in endoglin and ALK might cause endothelial cells to respond abnormally to TGFβ during the process of vascular remodeling, resulting in the formation of arteriovenous malformations. In congenital heart disease where the pulmonary circulation lacks any component from the hepatic veins (ie, following a Glenn-type palliation in which the superior vena cava is directly connected to the pulmonary arteries as the sole source of pulmonary blood flow), pulmonary arteriovenous malformations begin to develop after several years and enlarge further if no change is made to the circulation. Some patients with liver disease, mainly cirrhosis, develop pulmonary arteriovenous malformations. Initially, these are microscopic and progress in the absence of intervention to larger macroscopic arteriovenous malformations. Patients with congenital cardiac disease with a Glenn-type circulation have regression of small pulmonary arteriovenous malformations if venous return from the hepatic veins is provided to the pulmonary circulation. Larger pulmonary arteriovenous malformations may not regress, implying a threshold over which humoral control is no longer possible. Patients with liver disease who develop pulmonary arteriovenous malformations have regression of the pulmonary arteriovenous malformations if they undergo liver transplantation. Patients with extensive pulmonary arteriovenous malformations due to liver disease and significant arterial desaturation at rest may not be candidates for liver transplantation because of the very high mortality in this setting. In the early phases of progression of arteriovenous malformations seen in both congenital heart disease and liver disease, administration of 100% oxygen usually overcomes the A-a gradient, and the patient becomes fully saturated with a high PaO2. This implies that the pathophysiology of the arteriovenous malformations in these conditions is dilation of the normal capillary bed. In the early phases, a normal PAO2 is insufficient to overcome the diffusion gradient to the center of these dilated beds, resulting in some desaturation and an A-a gradient. However, with administration of 100% FiO2, the A-a gradient may be overcome, and the PaO2 increases to near-expected levels, abolishing the A-a gradient. In later stages, when the arteriovenous malformations become macroscopic, even 100% FiO2 does not overcome the A-a gradient, and the patient remains desaturated. See the A-a Gradient calculator. The exact pathogeneses of pulmonary arteriovenous malformations is unknown. In the terminal arterial loops, a defect that allows dilatation of the thin-walled capillary sacs may occur. Alternatively, pulmonary arteriovenous malformations are the result of incomplete resorption of the vascular septa that separate the arterial and venous plexus, which normally anastomose during fetal development. Some have also suggested that multiple small pulmonary arteriovenous malformations develop as a result of capillary development failure during fetal growth. The large saccular pulmonary arteriovenous malformations develop by means of progressive dilation of the smaller plexus, leading to the formation of tortuous loops and multiloculated sacs. With time, the intervening vascular walls may rupture, resulting in the formation of a single large saccular pulmonary arteriovenous malformation. The natural history of pulmonary arteriovenous malformations has not been studied carefully. The initial manifestation of HHT is the appearance of cutaneous telangiectases or epistaxis. Fewer than 10% of patients who have visceral involvement by arteriovenous malformations have visceral signs and symptoms (eg, dyspnea or GI bleeding) as the initial manifestation of HHT. The visceral manifestations occur in adults, reflecting the additional time needed for the enlargement of arteriovenous malformations. In one study of 16 patients, serial chest radiographs obtained over a median observation period of 18.9 years demonstrated enlargement in 4 patients and near total regression in 1 patient. The growth rate tended to be slow, with an increase of approximately 5-10 mm every 5-15 years. In a 1953 study from The Johns Hopkins Hospital, 3 cases of pulmonary arteriovenous malformations were detected in 15,000 consecutive autopsies. The Mayo Clinic encountered 63 cases during the 20 years ending in 1972, and 38 cases were encountered during the subsequent 9 years ending in 1981. Approximately 70% of the cases of pulmonary arteriovenous malformations are associated with HHT, which is an autosomal dominant disorder. Conversely, approximately 15-35% of persons with HHT have pulmonary arteriovenous malformations. To screen for occult brain, lung, and liver arteriovenous malformations in pediatric patients with confirmed HHT, a study undertook molecular analysis and clinical assessment. The molecular analysis demonstrated the mutation-carrier status in 22 of 35 children. Nasal telangiectases were found in 68%, mucocutaneous telangiectases (fingers, lips, oral cavity) in 79%, pulmonary arteriovenous malformations in 53%, hepatic arteriovenous malformations (HAVMs) in 47%, and cerebral arteriovenous malformations and/or cerebral ischemic changes secondary to pulmonary arteriovenous malformations in 12%. Mortality of pulmonary arteriovenous malformations is somewhat difficult to determine because of the association in many with HHT. Patients with HHT may also have arteriovenous malformations in the liver and head, as well as intestinal telangiectasias that also put them at risk for premature mortality. Mortality caused by pulmonary arteriovenous malformations is due to rupture, brain abscess, and stroke due to paradoxical embolization. In addition, therapeutic interventions for pulmonary arteriovenous malformations carry a low risk of mortality. The risk of mortality appears to be significantly higher in patients with bilateral, diffuse pulmonary arteriovenous malformations. In study of 26 patients followed for 27 years with diffuse bilateral pulmonary arteriovenous malformations, 2 died of complications related to the pulmonary arteriovenous malformations directly: one due to hemoptysis from rupture, and the other from cerebral abscess. Seven others died from other organ involvement with HHT. Pulmonary arteriovenous malformations occur twice as often in women than in men, but a male predominance is observed among newborns. Approximately 10% of the cases of pulmonary arteriovenous malformations are identified in infancy or childhood; however, the incidence gradually increases through the fifth and sixth decades of life. Ragsdale JA. Hereditary hemorrhagic telangiectasia: from epistaxis to life-threatening GI bleeding. Gastroenterol Nurs. 2007 Jul-Aug. 30(4):293-9; quiz 300-1. [Medline]. White RI Jr, Lynch-Nyhan A, Terry P, et al. Pulmonary arteriovenous malformations: techniques and long-term outcome of embolotherapy. Radiology. 1988 Dec. 169(3):663-9. [Medline]. Giordano P, Nigro A, Lenato GM, et al. Screening for children from families with Rendu-Osler-Weber disease: from geneticist to clinician. J Thromb Haemost. 2006 Jun. 4(6):1237-45. [Medline]. Pierucci P, Murphy J, Henderson KJ, Chyun DA, White RI Jr. New definition and natural history of patients with diffuse pulmonary arteriovenous malformations: twenty-seven-year experience. Chest. 2008 Mar. 133(3):653-61. [Medline]. Karam C, Sellier J, Mansencal N, et al. Reliability of Contrast Echocardiography to Rule Out Pulmonary Arteriovenous Malformations and Avoid CT Irradiation in Pediatric Patients with Hereditary Hemorrhagic Telangiectasia. Echocardiography. 2015 Jan. 32(1):42-8. [Medline]. Tomasian A, Lell M, Currier J, Rahman J, Krishnam MS. Coronary artery to pulmonary artery fistulae with multiple aneurysms: radiological features on dual-source 64-slice CT angiography. Br J Radiol. 2008 Sep. 81(969):e218-20. [Medline]. Poulikakos D, Theti D, Pau V, Banerjee D, Jones D. The impact of arteriovenous fistula creation in pulmonary hypertension: Measurement of pulmonary pressures by right heart catheterization in a patient with respiratory failure following arteriovenous fistula creation. Hemodial Int. 2012 Feb 23. [Medline]. Dupuis-Girod S, Ginon I, Saurin JC, Marion D, Guillot E, Decullier E, et al. Bevacizumab in patients with hereditary hemorrhagic telangiectasia and severe hepatic vascular malformations and high cardiac output. JAMA. 2012 Mar 7. 307(9):948-55. [Medline]. Grosso M, Groppo Marchisio F, Testa F, et al. Pulmonary arteriovenous malformations: percutaneous treatment preserving parenchyma in high-flow fistulae. Radiol Med. 2008 Apr. 113(3):395-413. [Medline]. Ishikawa Y, Yamanaka K, Nishii T, Fujii K, Rino Y, Maehara T. Video-assisted thoracoscopic surgery for pulmonary arteriovenous malformations: report of five cases. Gen Thorac Cardiovasc Surg. 2008 Apr. 56(4):187-90. [Medline]. Pollak JS, Saluja S, Thabet A, et al. Clinical and anatomic outcomes after embolotherapy of pulmonary arteriovenous malformations. J Vasc Interv Radiol. 2006 Jan. 17(1):35-44; quiz 45. [Medline]. Bialkowski J, Zabal C, Szkutnik M, et al. Percutaneous interventional closure of large pulmonary arteriovenous fistulas with the amplatzer duct occluder. Am J Cardiol. 2005 Jul 1. 96(1):127-9. [Medline]. McFaul RC, Tajik AJ, Mair DD, et al. Development of pulmonary arteriovenous shunt after superior vena cava- right pulmonary artery (Glenn) anastomosis. Report of four cases. Circulation. 1977 Jan. 55(1):212-6. [Medline]. Cloutier A, Ash JM, Smallhorn JF, et al. Abnormal distribution of pulmonary blood flow after the Glenn shunt or Fontan procedure: risk of development of arteriovenous fistulae. Circulation. 1985 Sep. 72(3):471-9. [Medline]. Laks H, Kaiser GC, Mudd JG, et al. Revascularization of the right coronary artery. Am J Cardiol. 1979 Jun. 43(6):1109-13. [Medline]. Gomes AS, Benson L, George B, Laks H. Management of pulmonary arteriovenous fistulas after superior vena cava- right pulmonary artery (Glenn) anastomosis. J Thorac Cardiovasc Surg. 1984 Apr. 87(4):636-9. [Medline]. Allen SW, Whitfield JM, Clarke DR, et al. Pulmonary arteriovenous malformation in the newborn: a familial case. Pediatr Cardiol. 1993 Jan. 14(1):58-61. [Medline]. Beck A, Dagan T, Matitiau A, Bruckheimer E. Transcatheter closure of pulmonary arteriovenous malformations with Amplatzer devices. Catheter Cardiovasc Interv. 2006 Apr 30. 67(6):932-937. [Medline]. Borsellino A, Giorlandino C, Malena S, et al. Early neurologic complications of pulmonary arteriovenous malformation in a newborn: an indication for surgical resection. J Pediatr Surg. 2006 Feb. 41(2):453-5. [Medline]. Chilvers ER, Whyte MK, Jackson JE, et al. Effect of percutaneous transcatheter embolization on pulmonary function, right-to-left shunt, and arterial oxygenation in patients with pulmonary arteriovenous malformations. Am Rev Respir Dis. 1990 Aug. 142(2):420-5. [Medline]. Dutton JA, Jackson JE, Hughes JM, et al. Pulmonary arteriovenous malformations: results of treatment with coil embolization in 53 patients. AJR Am J Roentgenol. 1995 Nov. 165(5):1119-25. [Medline]. Faughnan ME, Lui YW, Wirth JA, et al. Diffuse pulmonary arteriovenous malformations: characteristics and prognosis. Chest. 2000 Jan. 117(1):31-8. [Medline]. Faughnan ME, Thabet A, Mei-Zahav M, et al. Pulmonary arteriovenous malformations in children: outcomes of transcatheter embolotherapy. J Pediatr. 2004 Dec. 145(6):826-31. [Medline]. Ference BA, Shannon TM, White RI Jr, et al. Life-threatening pulmonary hemorrhage with pulmonary arteriovenous malformations and hereditary hemorrhagic telangiectasia. Chest. 1994 Nov. 106(5):1387-90. [Medline]. Gallitelli M, Guastamacchia E, Resta F, et al. Pulmonary Arteriovenous Malformations, Hereditary Hemorrhagic Telangiectasia, and Brain Abscess. Respiration. 2005 Jul 21. [Medline]. Gossage JR, Kanj G. Pulmonary arteriovenous malformations. A state of the art review. Am J Respir Crit Care Med. 1998 Aug. 158(2):643-61. [Medline]. Heutink P, Haitjema T, Breedveld GJ, et al. Linkage of hereditary haemorrhagic telangiectasia to chromosome 9q34 and evidence for locus heterogeneity. J Med Genet. 1994 Dec. 31(12):933-6. [Medline]. Johnson DW, Berg JN, Baldwin MA, et al. Mutations in the activin receptor-like kinase 1 gene in hereditary haemorrhagic telangiectasia type 2. Nat Genet. 1996 Jun. 13(2):189-95. [Medline]. Laks H, Williams W, Trusler G, Castaneda A. Subclavian arterioplasty for the ipsilateral subclavian-to-pulmonary artery shunt. Circulation. 1979 Aug. 60(2 Pt 2):115-9. [Medline]. Lenato GM, Guanti G. Hereditary Haemorrhagic Telangiectasia (HHT): genetic and molecular aspects. Curr Pharm Des. 2006. 12(10):1173-93. [Medline]. McAllister KA, Grogg KM, Johnson DW, et al. Endoglin, a TGF-beta binding protein of endothelial cells, is the gene for hereditary haemorrhagic telangiectasia type 1. Nat Genet. 1994 Dec. 8(4):345-51. [Medline]. Pooyan P, Shah L, Goli S, et al. Post-traumatic thoracic arteriovenous fistulas. Tenn Med. 2005 Apr. 98(4):181-3. [Medline]. Porteous ME, Burn J, Proctor SJ. Hereditary haemorrhagic telangiectasia: a clinical analysis. J Med Genet. 1992 Aug. 29(8):527-30. [Medline]. Puskas JD, Allen MS, Moncure AC, et al. Pulmonary arteriovenous malformations: therapeutic options. Ann Thorac Surg. 1993 Aug. 56(2):253-7; discussion 257-8. [Medline]. Remy J, Remy-Jardin M, Wattinne L, Deffontaines C. Pulmonary arteriovenous malformations: evaluation with CT of the chest before and after treatment. Radiology. 1992 Mar. 182(3):809-16. [Medline]. Shovlin CL, Guttmacher AE, Buscarini E, et al. Diagnostic criteria for hereditary hemorrhagic telangiectasia (Rendu- Osler-Weber syndrome). Am J Med Genet. 2000 Mar 6. 91(1):66-7. [Medline]. Sluiter-Eringa H, Orie NG, Sluiter HJ. Pulmonary arteriovenous fistula. Diagnosis and prognosis in noncomplainant patients. Am Rev Respir Dis. 1969 Aug. 100(2):177-88. [Medline]. Sperling DC, Cheitlin M, Sullivan RW, Smith A. Pulmonary arteriovenous fistulas with pulmonary hypertension. Chest. 1977 Jun. 71(6):753-7. [Medline]. Swanson KL, Prakash UB, Stanson AW. 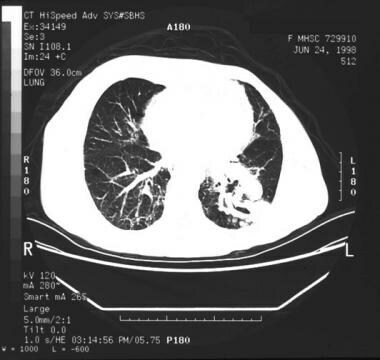 Pulmonary arteriovenous fistulas: Mayo Clinic experience, 1982-1997. Mayo Clin Proc. 1999 Jul. 74(7):671-80. [Medline]. Ueki J, Hughes JM, Peters AM, et al. Oxygen and 99mTc-MAA shunt estimations in patients with pulmonary arteriovenous malformations: effects of changes in posture and lung volume. Thorax. 1994 Apr. 49(4):327-31. [Medline]. Vase P, Holm M, Arendrup H. Pulmonary arteriovenous fistulas in hereditary hemorrhagic telangiectasia. Acta Med Scand. 1985. 218(1):105-9. [Medline]. Another view of the infused CT scan of the left lower lobe arteriovenous malformation (AVM). Pulmonary angiographic findings are required not only to confirm the diagnosis but also to plan therapeutic embolization. Small arteriovenous malformations (AVMs) in the right and left lower lobes. Lateral radiograph shows a left lower lobe arteriovenous malformation (AVM). Contrast-enhanced CT scan showing a left lower lobe arteriovenous malformation (AVM). Right lower lobe arteriovenous malformation (AVM). CT scan obtained after coil embolotherapy. Left lower lobe embolotherapy performed at the same sitting as the coil embolotherapy depicted in the previous image. Same-Day Discharge Following Atrial Fibrillation Catheter Ablation: The Perfect Blend?